Nikto's homeworld Barada was a moon orbiting a gas giant in a distant star system where the Baradan race had survived for years. Life was getting harder and harder on Barada, which was being torn apart by strong tectonic and volcanic activity. The last twenty-three generations of queen leaders have been preparing for the eventual mass exodus away from Barada to Earth. Princess Nikto suddenly became the leader of the Baradans when her mother the queen died during the destruction of their homeworld. Nikto was too young to have absorbed the collective consciousness of her ancestors, and is working without a plan with her army to take Earth. Most Baradans are male and don't talk. They have no independent thoughts except for their base needs and their duty to follow their leader's orders. Because Princess Nikto doesn't have the ability to command all her units at once, males will carry out their orders until they recive new ones. 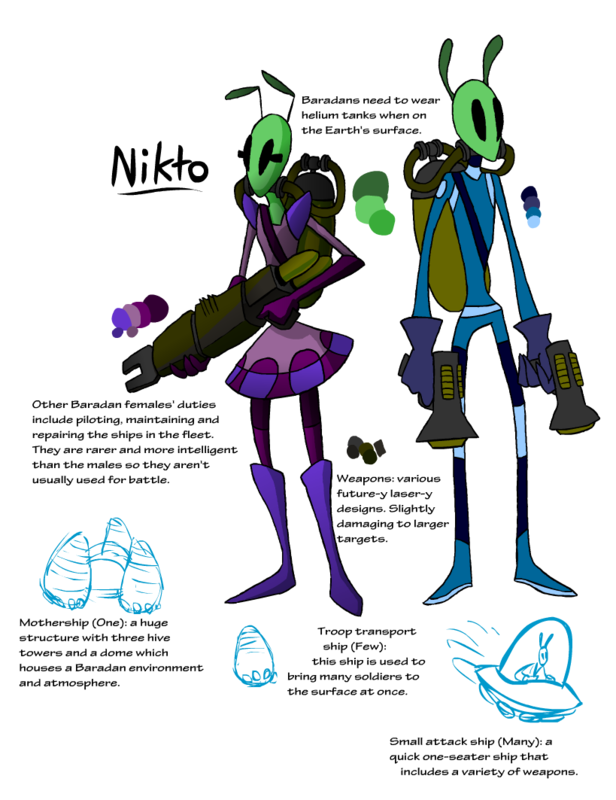 Nikto will command a small group of them on surface missions. Nikto speaks English and can use pheremones to command her troops.